Relatives and neighbors wail during the joint funeral of teenage rebels Saqib Bilal Sheikh and Mudasir Rashid Parray at Hajin village, north of Srinagar, Indian controlled Kashmir, Monday, Dec. 10, 2018. Two teenagers — Mudasir Rashid Parray, 14, and Saqib Bilal Sheikh, 16 — went missing from their native village Hajin, some 50 kilometers north of Srinagar in Indian Kashmir on August 31. According to reports, Bilal’s mother had sent him to run an errand at the market but he did not return. Instead, somewhere between his home and the market, he met Mudasir. “Both the boys decided to go somewhere and scaled the fence of a playground to reach the nearby highway where a bike was waiting for them,” Asim Aijaz, Bilal’s maternal uncle told The Diplomat. Fast forward a few months. On December 9, hundreds of people participated in their funeral procession. 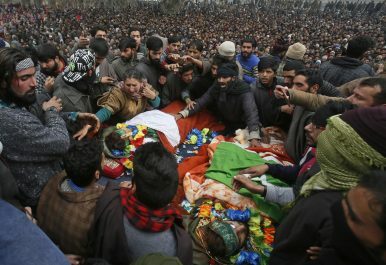 They were killed along with another Pakistani militant in an 18-hour-long gun battle with Indian security forces on the outskirts of the summer capital, Srinagar. Mudasir was the youngest militant killed in the three decade-old armed conflict in Kashmir that has consumed nearly half a million lives so far, including 80,000 militants. Since July 2016, the situation has taken a turn for the worse with the killing of Burhan Wani, a charismatic young militant commander. Wani’s killing renewed the trend of local youth joining the militant ranks, a trend which had slowed considerably in the intervening years since early 2000s, when relative normalcy had returned to Kashmir. The cases of Mudasir and Saqib have added another worrisome dimension to the phenomenon of teenage militants, leaving the security establishment grappling for answers. This is not the first instance in which teenagers have joined the militant ranks in Kashmir. Burhan Wani, too, had picked up the gun when he was only 15. In 2017, two young boys — Faizan, 15, and Fardeen, 17 — had also taken up arms to fight Indian rule. While Faizan was killed in May 2017, two months after joining the militancy, Fardeen, became the first teenager ever to have conducted a fidayeen attack in early 2017 targeting a security forces’ camp in South Kashmir’s Pulwama. Taking the local militancy head on, last year Indian security forces launched “Operation All Out” to neutralize the insurgency. The operation has proved to be bloody, with around 200 militants killed at the last count. Yet, instead of weakening the insurgency, the number of youth joining militant outfits such as the Hizbul Mujahideen, Ansarul Ghazwatul Hind and Lashkar-e-Taiba, has remained steady. What is forcing these boys to pick up arms is a question with an elusive answer. Experts believe that the protracted struggle for Kashmir’s right to self-determination is motivating the youth to take up arms and unless they achieve that goal, the youth will continue to join the militancy. “It’s a long-cherished desire [self-determination] which motivates youth to join militancy. It’s a social phenomenon that is passing from one generation to next. No one is forcing them to pick up arms,” Sheikh Showkat Hussain, a political commentator from Kashmir, told The Diplomat. Mudasir’s father, however, feels that his son’s shoulders were too young to carry an assault rifle, “I do not question his choice, but I feel he was too young for the responsibility,” he stated. Whatever the circumstances, this phenomenon of teenage militants puts Kashmir at odds with international humanitarian law which prohibits recruitment of juveniles in any kind of armed conflict. Recruitment of children by armed groups violates the Geneva Conventions. Specifically, the 1977 Additional Protocols to the Geneva Conventions prohibit the recruitment and participation in hostilities of children under the age of 15. The 1989 Convention on the Rights of the Child, which has achieved almost universal ratification, also included the age of 15 limit. The killing of these teenage militants has stirred a debate among netizens who questioned both the militants for letting them join the ranks and security forces for killing them instead of giving them a chance to surrender. However, many believe that security forces had the option to allow the young boys to surrender instead of killing them. “There was an option to arrest or motive them to surrender, instead bodies of militants were charred badly. It shows that the state is at war with the people,” Abdul Basit, a resident of South Kashmir said. While India will be happy to shift the blame to militant groups for recruiting teenagers, Mudasir and Saqib’s cases also brings another headache for the Indian security establishment. Both militants were operating from the Hajin belt, which was once home to the Ikhwan-ul- Musalmoon, a home-bred counter to Kashmiri insurgency at its peak in the 1990s. Of late, the place has emerged as the hotbed of militancy in north Kashmir where the militants often hide. The crackdown on the militants has not discouraged the youth from joining the militancy. Per figures issued earlier this year by the Jammu and Kashmir Government, nearly 280 youths have joined militancy in the last three years, with 126 joining militant ranks last year alone. This year, per reports, more than 80 have joined militant ranks. In the absence of political solutions, militancy is showing no signs of weakening and Indian security forces have continued the tempo of counter insurgency operations to fend off the local insurgency. With these circumstances, it looks like that Indian Kashmir is poised to enter another phase of heightened violence. This will act as a catalyst for more youth to join the militant ranks, including teenagers for whom the only stories around them are the stories of death and destruction. In this scenario, Kashmir’s society will have to take urgent remedial steps to address this dimension and change the narrative, lest an entire generation gets embroiled in the cycle of recurrent violence. Um-Roommana and Suhail Bhat are freelance journalists based in Kashmir. India and Pakistan on the BrinkWhat the Pulwama Attack Means for KashmirisThe Human Cost of India-Pakistan ConflictAadhaar: India's Flawed Biometric DatabaseCan India Jumpstart the Kashmir Peace Process?